South London singer-songwriter/producer MNEK has thus far been on an incredible and compelling journey that has seen him collaborate with the likes of Madonna, Beyoncé, Dua Lipa and Stormzy, but now the 23-year-old pop auteur has finally delivered his ultimate statement in the shape of the stunning debut album, ‘Language’. Alternative cabaret star Le Gateau Chocolat pushes the boundaries of drag culture, covering social and political themes in his solo shows. His family show Duckie, a reimagining of The Ugly Duckling for the 21st Century that tackles identity and tolerance, just completed a sell-out run at the Edinburgh Festival. Brought together in conversation, the pair discussed their shared Nigerian roots, homophobia, racism, and the responsibilities of fame. 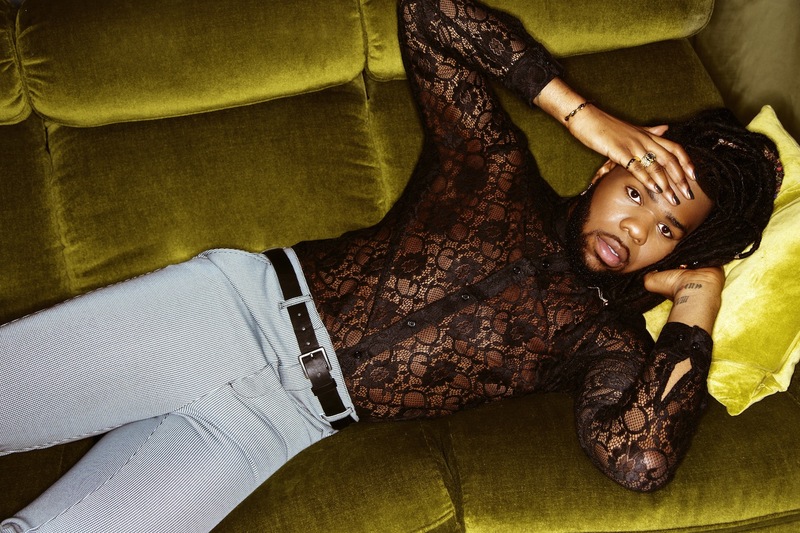 MNEK: This is my first album and it’s talking about me as a young man, and it’s talking about me falling in love, and also me and my career, and I feel like this is now the time where I’m getting into my art, understanding what my unique selling point is, and also making the most of it and giving people the chance to understand a different lens on the gay experience; a chance to really push things in a different type of way and open conversations in the communities - the gay community, the black community - and have the music be some sort of activism in that kind of way. I’ve met you a few times and it’s sick to get to talk to you and really get your background as far as your story and your experiences being a black gay entertainer. LGC: The older I get, the more comfortable I feel starting to tackle and talk about these issues. But, more importantly, I’m starting to feel like it’s a privilege to have the microphone, but I also feel like it’s a responsibility to have the microphone. This morning, just scrolling through some of the news items, there was a story of a boy who came out to his mum in the last week. Within four days, the bullying was so bad with people telling him to kill himself, he actually did, and that’s why I feel like it’s a responsibility. I think there’s this skewered notion that because things like Drag Race and RuPaul are kind of centralised and have more coverage that the war is won or that we have gained a lot of ground, and that just isn’t the truth. Even if that were the case - I mean, to some degree that is the case - that just represents one sector, one part of an entire community. There are many groups to this movement - that’s just one part of who we are. That’s why sometimes, even for myself, because I don’t necessarily fit into this mainstream idea of what people expect drag to be, I feel it’s so important to start and to continue excavating further into what it is to be black, gay, queer, plus size - to be all these things - and to kinda underline the marginalisation. MNEK: Sometimes it’s not even what people say; it’s what people do. It’s just circumstances. It’s the make-up of society. Certain things like that are out of our control but we see it and we live through it and we have to bite our tongue, or we have to be comfortable with it. I guess it goes back to what you were saying in that it’s a massive responsibility to have a microphone, and there is so much more to do. I think it will be the death if we ever assume that everything is done and everything is where it needs to be, because we will always be the minority, and we will always be seen as different. I come from a perspective where I admire so many queer musicians, artists, performers, entertainers of colour, but it’s a sad feeling having this ongoing knowing that we will never be as commercially successful or prolific as our white counterparts. Can I ask you a personal question? MNEK: What was your parents’ reaction to putting your sexuality and your persona out there in that way from a performance point view and so publicly? LGC: How I deal with it has been indirect in that I’ve let my work do the talking. They still live in Nigeria. As you know, it’s a completely different reality there. I chose to tackle it by making my work do the talking. So, for instance, in the family show that I’ve made, which is based on The Ugly Duckling, the show deals with homophobia and racism and bullying and body shaming, and I think in the theatrical context, when you are able to digest my make-up, in that situation it isn’t just drag: in that situation it becomes a vehicle for delivering this powerful message. It humanizes that side of who I am and what I do by packaging it with the message. MNEK: I really get that. I think that’s something that I’m definitely every day trying to remind my parents, that there’s so much better that I’m doing by doing this than not doing it. MNEK’s debut album ‘Language’ is out now on Virgin EMI. For Le Gateau Chocolat’s winter dates, see legateauchocolat.com.